In addition, a cash on delivery fee in the amount of 3.00 EUR and a forwarding fee of 3.00 EUR will be levied. The acquisition of the object of supply is subject to VAT regulation in another member state, i.e. the acquiror is obliged to make acquisition tax declaration in another EU state (this obligation of the acquiror is documented by use of the VAT Reg. No. of another member state). All of our packages will be shipped via DHL or DPD. Environment-friendly and uncomplicated. Tax free intra-community delivery if value added tax identification number is valid! Except as provided in the item description of any other period, the delivery of the goods in Germany takes place within 1-2 days, for international deliveries within 5-7 days. When paying in advance the delivery period begins upon receipt of payment. Note that on Sundays and holidays no notification is made. For collection we will notify you by email about the availability of the goods and the pick-up options. In this case, no shipping costs will be calculated. For deliveries to non-EU countries there are additional duties, taxes and fees. 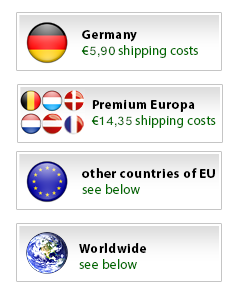 The shipping costs are given in Euros (€) and include German VAT of currently 19%.